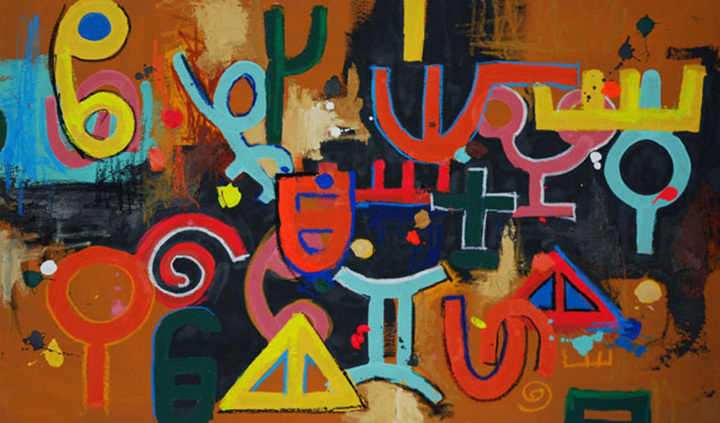 Afáka stands in notable isolation: it is the only script still used for a creole language, and the one indigenous writing system of South America still in use. 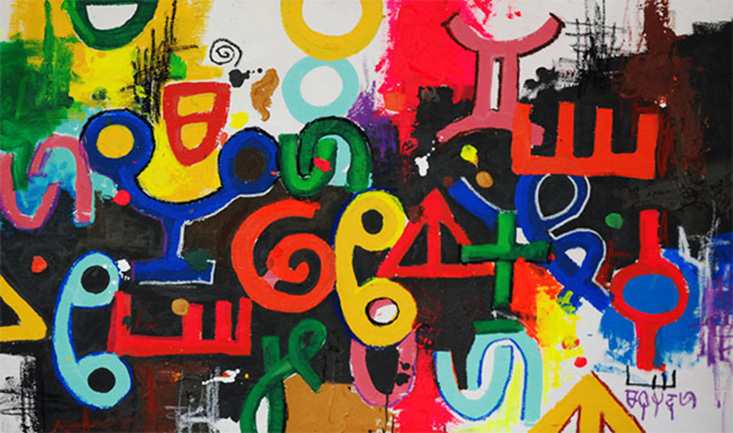 The Afáka script was created around 1908-1910 by Usa Atumisi Afáka—hence the name of the script–to write the Okanisi or Ndyuku language, a Surinamese Afro-English (creole) currently spoken by about 23,000 people in Suriname and French Guyana. 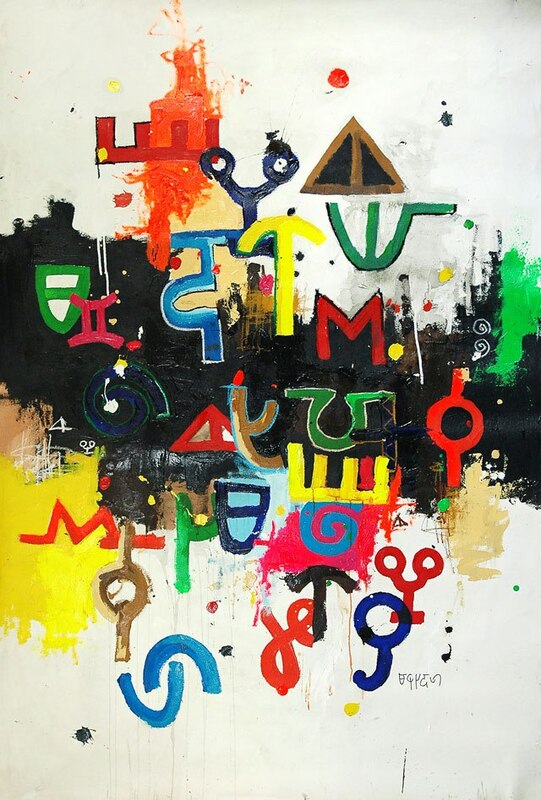 Afáka’s script came to the attention of the wider world in 1915 when Brother Bernard, a Catholic missionary in Suriname, observed a man reading a book full of unknown symbols. The man was Afaka’s nephew Abena, one of about 30 people to whom Afáka had taught the script. Abena asked Br. Bernard to dictate a number of liturgical Catholic prayers in the Ndyuku language, which he then recorded in the script. Much of what is known about the script is attributed to Br. Bernard’s colleague, Father Morssink, who went to considerable lengths to study and propagate the script, with limited success. The number of current users at one point fell to a low of about 20, but has been increasing due to activities of André R.M. Pakosie and the Sabanapeti Foundation, which supports the use of the script. 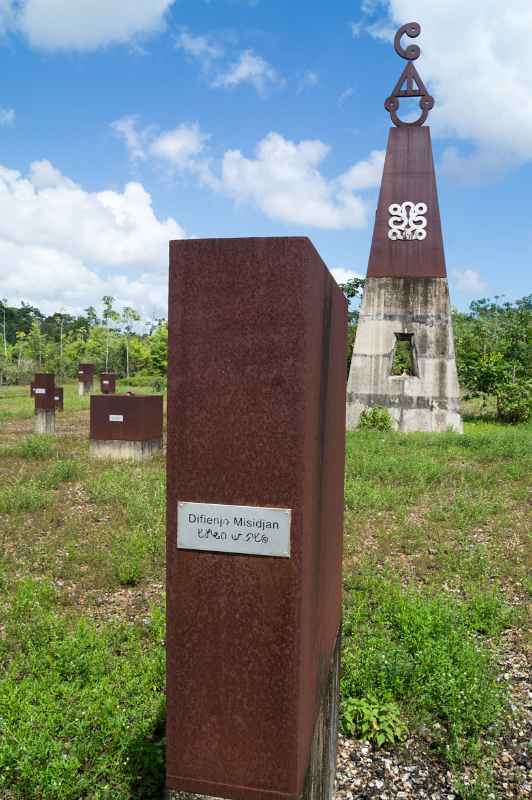 “Because of the Afáka script the Okanisi Maroons are the only Creole-speaking people, at least in the Americas, who own their own script. 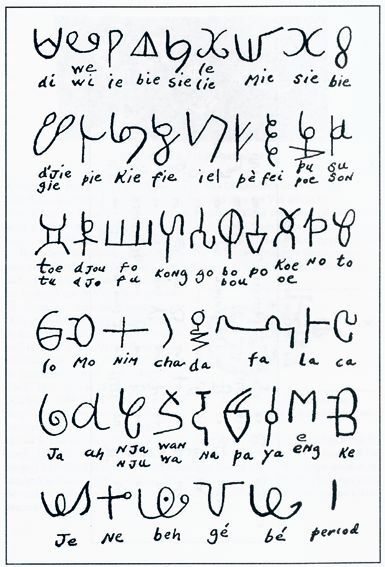 “This script was designed by da Usa Atumisi Afáka, an Okanisi Maroon. He lived between 1875 and 1920. 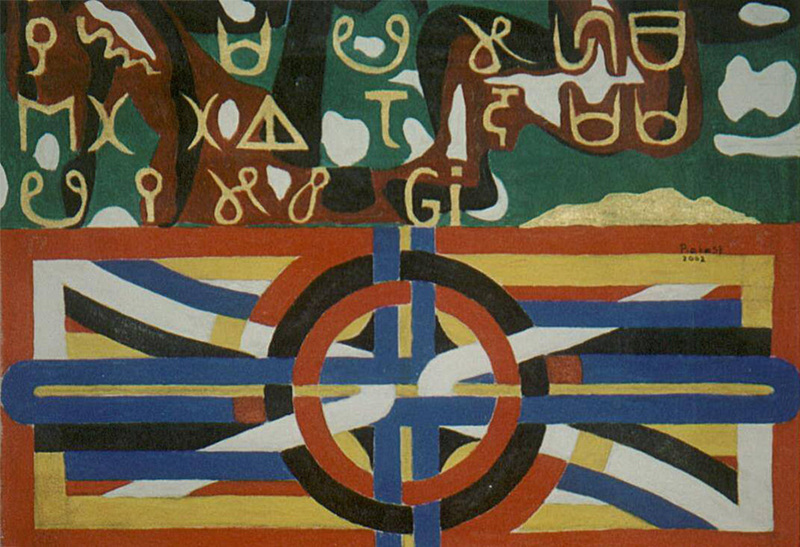 Da Afáka wanted to have a type of script that would enable his people, the Okanisi, to learn to read and write. 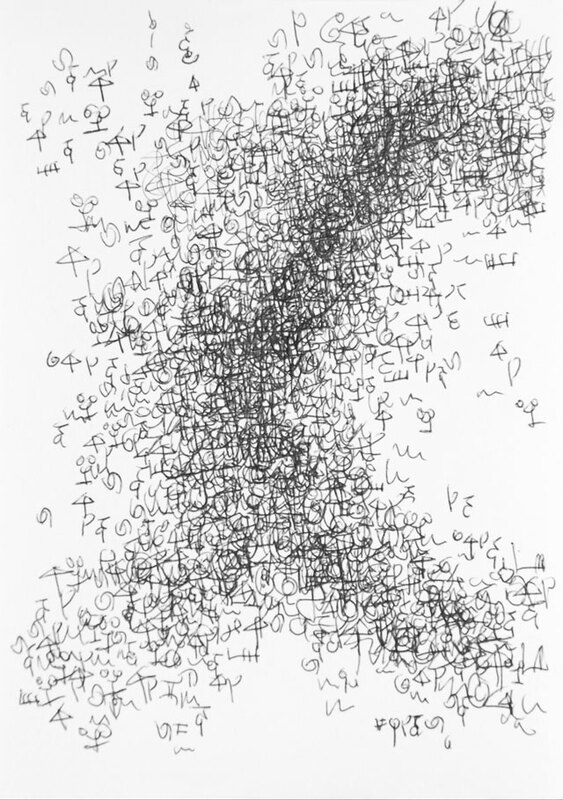 “According to da Afáka’s story, he received in dreams, one by one, the characters which he wrote on paper the next day. He eventually came to 56 characters, with which he could convert thoughts into written stories. In this way this type of script originated with the Okanisi Maroons, and which is named after him, the Afáka script. “Da Afáka taught a few people in his immediate vicinity the script so they could read and write. Within a few years, a dozen of the Okanisi could use the Afáka script–men, women and children. “One of the first people da Afáka taught the script, was his nephew da Abena. In turn da Abena taught his son Alufaisi, in those days still a child, the script. 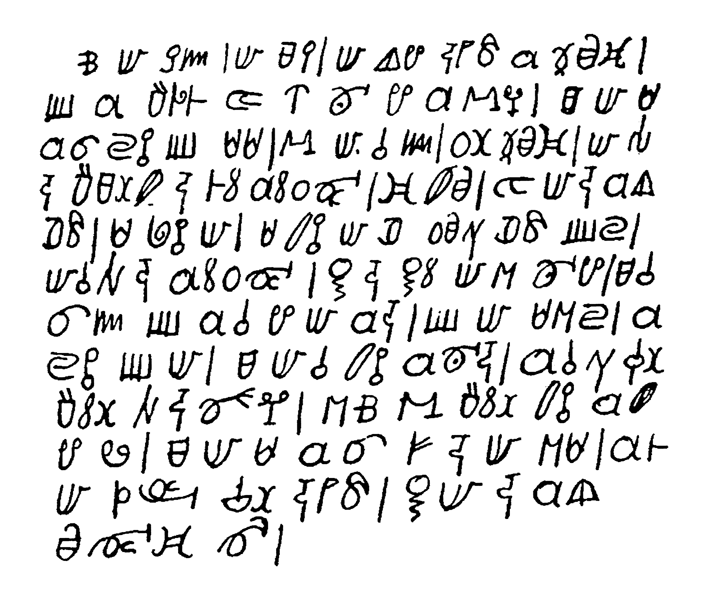 Alufaisi also learned the Afáka script directly from da Afáka. At a later age, Alufaisi became the third Edebukuman, or head teacher of the script. “I learned the Afáka script from da Alufaisi, and on 1 July 1977 he wrote a declaration in the Afáka script, stating that he taught me the script and that I was his successor as Edebukuman, after his death. Furthermore he ordered me that I must ensure that the script would be propagated and not allowed to lapse. I must teach the script to others. “After the death of da Alufaisi in 1993, I became, by his decree, the Edebukuman. As Edebukuman I am the guardian of this special syllable script of the Okanisi Maroons from the Tapanahoni area. And I work steadily on the execution of da Alufaisi’s assignment. This means that I do my utmost to ensure that the script is widely known among the Okanisi and other interested people, and is passed on to the next generation. For this purpose, I have been organising training courses Afáka for years, individually or in cooperation with Sabanapeti Foundation. “Long before the previous Edebukuman, Alufaisi Kasitioe, died, I showed him that the script requires additions. This is one of the assignments he gave me too, namely to search for useful additions. At the same time, he also made me aware that the designer, da Afáka, when designing the script, used a certain particular logic embedded in the (Okanisi) Maroon culture. Alufaisi asked me to do deep research first on this logic and to follow the outcome of any possible additions. I have been working on this for years. 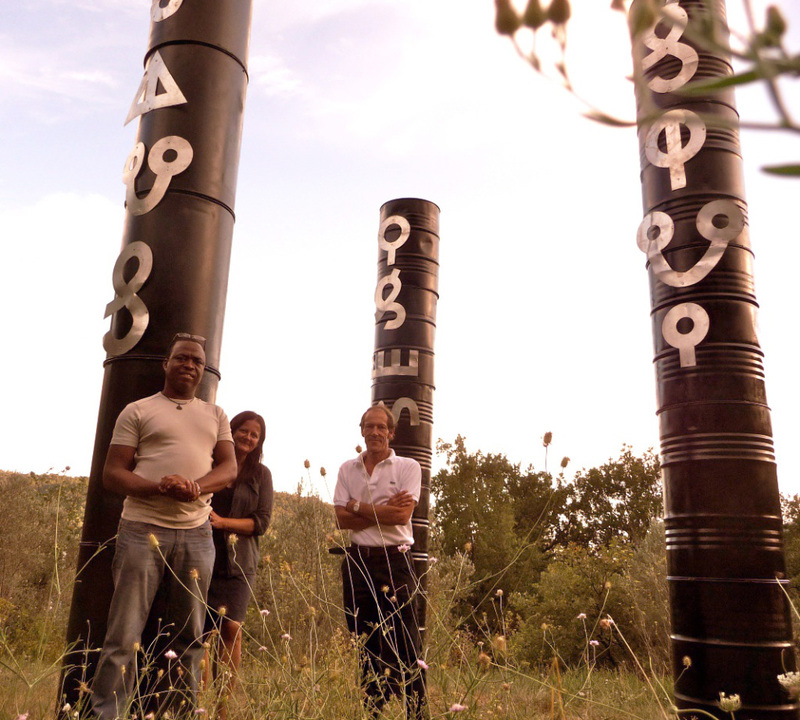 “I have already taught 75 people the Afáka script, in both Surinam and the Netherlands. The number of people who have learned the script is thus not yet big enough. “I have noticed that there are a few of this number who use it every day. I know only three who regularly used the Afáka script to write things down in their notebooks, but there are others who use the Afáka script in their art.